Sengoku 3 for Neo Geo AES. Note 1: Like Beat ‘Em Ups? Check out my reviews of Bare Knuckle III, Crows: The Battle Action, Double Dragon II, Final Fight Guy, Final Fight 2, Mighty Final Fight, Nekketsu Oyako, and Warriors of Fate! 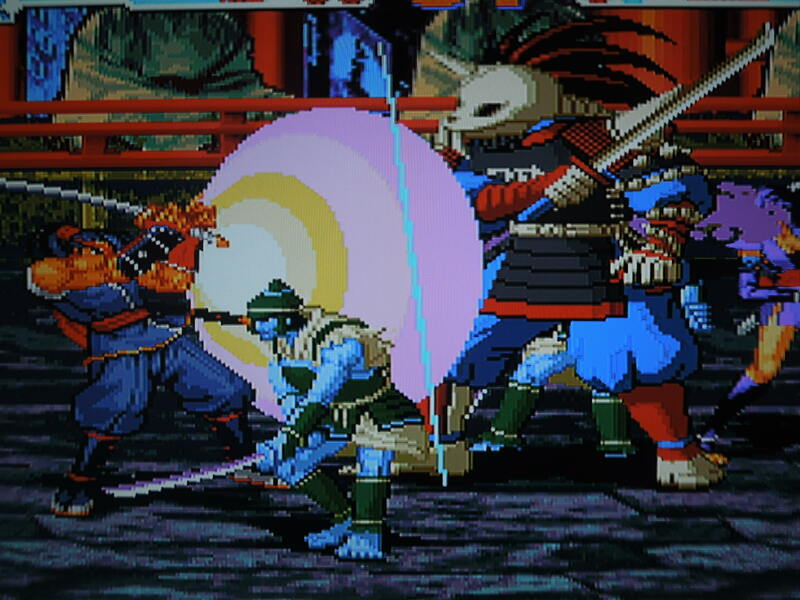 Quick History: Sengoku 3 was released for the Neo Geo MVS (arcade cabinet) in 2001. It also had a very, very limited release for the Neo Geo AES home console in 2001. 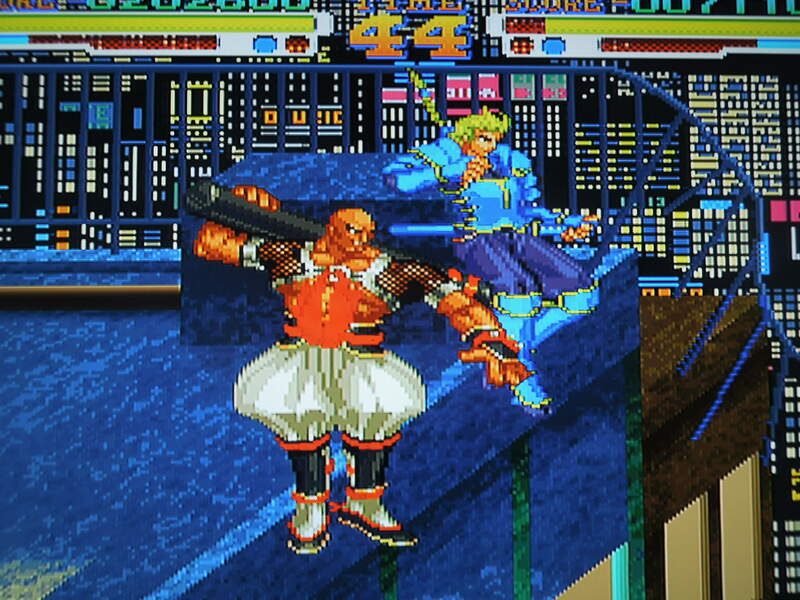 It was one of the games produced near the end of the life cycle of the Neo Geo. It was the 3rd game in the ‘Sengoku’ series, and like its predecessors, it is a Beat ‘Em Up, although its story and gameplay are much different. 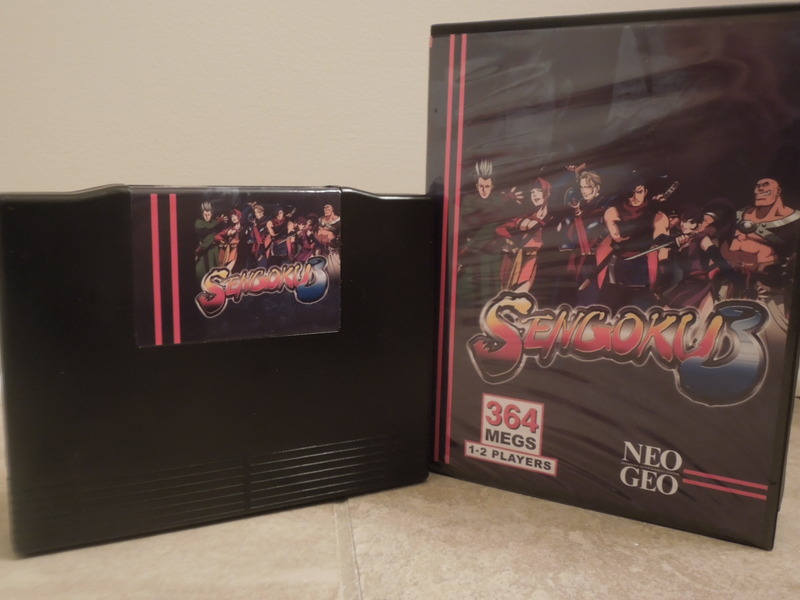 The copy that is used for this review is an AES conversion – meaning that an MVS (arcade cabinet) cartridge of Sengoku 3 was professionally converted into an AES home console cartridge. Neo Geo Memory Card: If you lose all of you lives and use all 4 of your given credits, you can save the game. If you load the save again at that time or later, you’ll start on the stage you were on when you died. 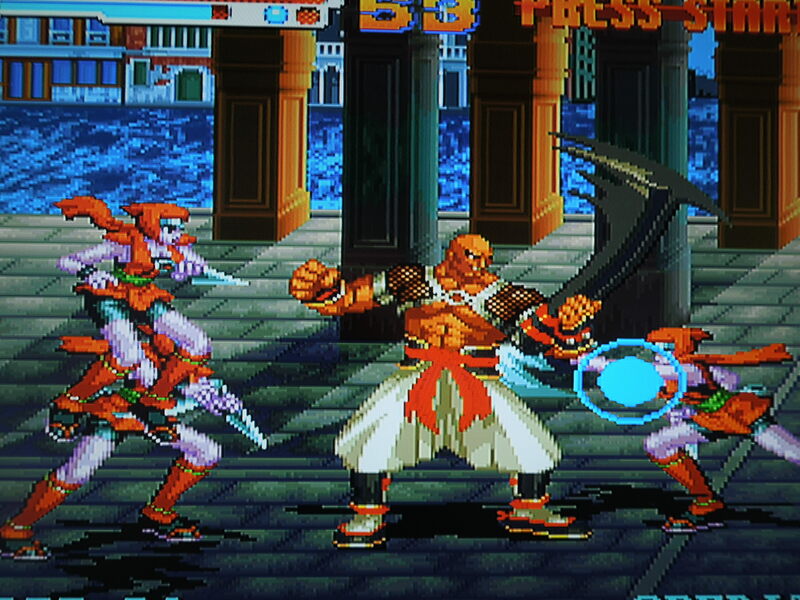 Sengoku 3 had a limited AES release. Today, you can find MVS arcade cartridges that have been converted into AES home console cartridges. Story: “It is a prophecy passed down through the ages. The Timeless Soul shall revive and descend from the heavens with the red moon. Thereafter, flames of conflict will engulf the Earth. The prophecy ends thus: The Ninjas of Peace shall rise with the coming of the Timeless Soul. And their mission to purify the tortured entity shall be fulfilled.” That’s an exact transcript of the story in the opening scenes…So, yeah, basically, some Evil Samurai Emperor has returned to Earth, and you and your fellow ninjas must decimate his undead army and finally destroy him as well. 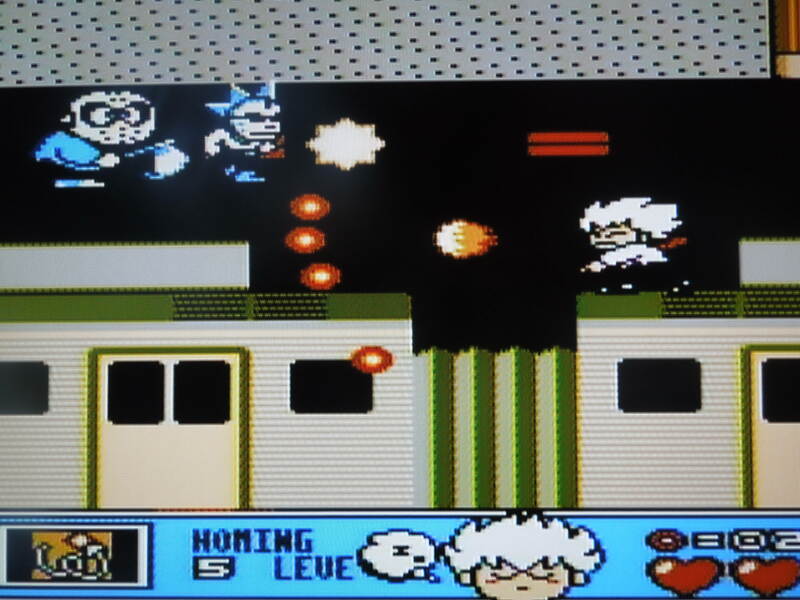 Characters: The game is for up to 2 players, and you select from 4 Ninjas to start the game: Kegatsura, Falcon, Kurenai, and Kongoh. After you beat the game’s first 3 stages, two additional characters become selectable: Okuni and Byakki. These two characters had evidently been accused of betraying the Ninjas of Peace, but after you beat them in battle, they proclaim their innocence and join you on your quest to kill the Evil Samurai Emperor. All characters carry some type of weapon at all times, like a sword or a huge iron pipe. Some characters are quicker and weaker, while some are stronger and slower or more balanced. Additionally, some characters have a further reach with their weapons than others. All of your selectable characters carry a weapon. Control: There’s a handy ‘How to Play’ explanation in the Options menu of the game, but here are the controls. A swings your weapon. B punches with your fist. A great thing about Sengoku 3 is the combo system – your character will immediately start chaining together combo hits as you press A and B, and it’s fun to play around and see how many hits in your combo chain you can get. Getting in close to an enemy will cause you to automatically grab him or her, and pressing A or B will execute a throw. Down + B will cause you to pick up items you find, like food or projectile weapons. C jumps. Pressing A or B in the air executes a weapon attack or jump kick. D throws a projectile like a bomb, plate, or ninja star (when you pick them up – you carry a limited amount). Double tapping forward or backward will make your character run forward or evade backwards. While running, pressing A or B will execute a dash attack. You have a ‘special’ bar that builds as you kill enemies. When it is full, you can do Specials. Down, Down A does Special 1. Down, Down, B does Special 2. Down, Up, A + B executes your Super Attack. A + B + C executes a special ‘escape attack.’ Each character has their own unique Specials and Super Attack. Screen-filling Super Attacks look incredible. Gameplay: In Sengoku 3, you’ll play through 6 levels of Beat ‘Em Up action: China, Japan, Italy, Brazil, U.S., and Kyoto. At the beginning of the game, you can choose which stage (China, Japan, Italy) you want to play first, second, and third. As you battle your way through the game’s stages, you’ll notice that some stages have alternate paths you can take, some of which you’ll have to ‘discover’ by knocking down a hidden wall or barrier. Each stage ends with a boss. You have 4 credits to complete the game, although you can change the number of lives you get per credit (1-8) as well as the difficulty of the game (levels 1-8) in the Options menu. Some of the game’s 6 levels have branching paths. Items: As you play through the game, you’ll break open objects to reveal food or treasure items. Different food items replenish different amounts of your health, and different treasures award different amounts of points. You have a high score, but gaining points doesn’t award you any extra lives. It’s really nice that you have to press Down + B to pick up items, as too often in these types of games you have to simply press the ‘attack’ button to pick up items, and your character would bend down to grab a hamburger when you meant to punch an enemy – that won’t happen in Sengoku 3, thankfully. Music & Sound: The music in Sengoku 3 is quite good. There are different themes during each stage of the game – particularly memorable and ominous is the theme that begins to play as you get ready to fight the final boss, the Samurai Emperor. The sound effects are great. The slash of your weapons on enemies, the clang of colliding weapons, and the blasts from your Specials all sound fantastic. 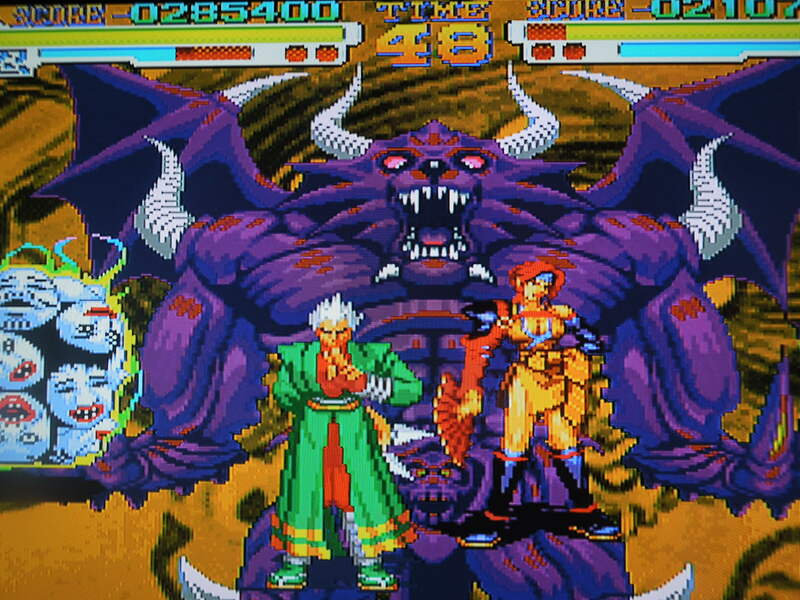 Sengoku 3 has a couple of truly memorable bosses. So, where can I find this game? 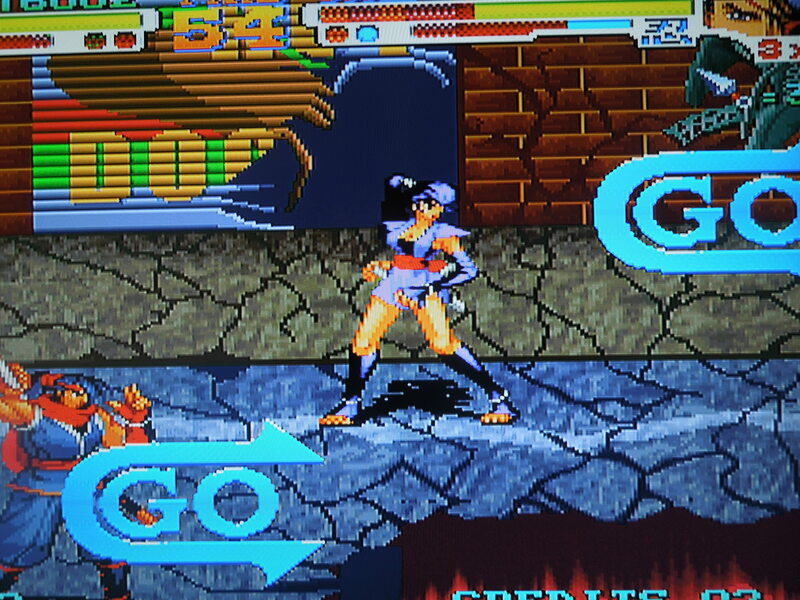 You can find MVS (arcade cabinet) cartridges of Sengoku 3 without too much trouble on sites like ebay, if you have an arcade cabinet to play it on, of course. However, if you want to play an AES cartridge, you’ll have to do some real hunting to find one of the few that was originally released for the AES. There are Neo Geo websites that sell conversion cartridges like the one I used for this review. You can also download the rom for play on a computer emulator. The Samurai Emperor is one of the all time toughest final bosses in any video game. Conclusion: This is one excellent Beat ‘Em Up. It has one of the best ‘combo’ systems I’ve ever seen in a game from this genre. 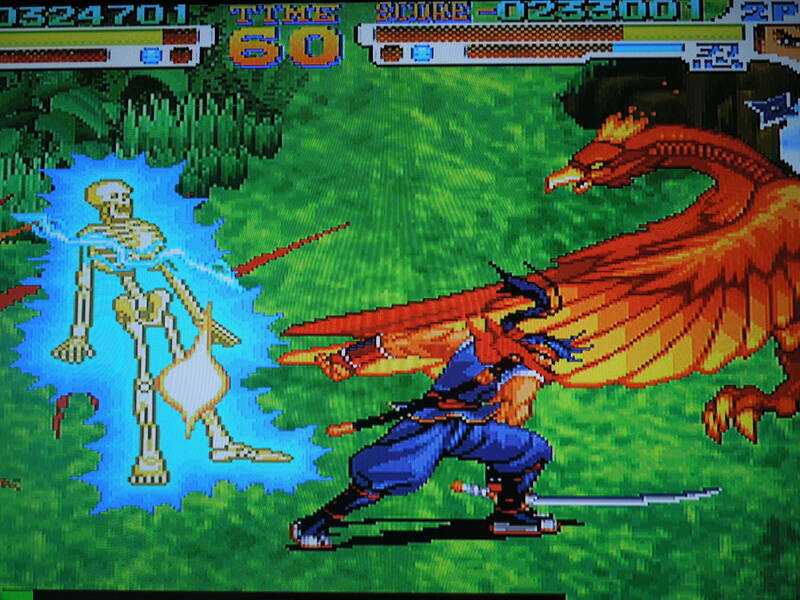 It is very, very, simple to pick up and play Sengoku 3. The characters are big and vibrant, and the Specials look absolutely stunning. Having 8 levels of difficulty is a great addition as well, although I should mention this – the game’s final boss, the Samurai Emperor is TOUGH (some would say cheap, although you can figure out his patterns). You’ll feel pretty good about dispatching the game’s other bosses, but the Emperor uses a special move almost non-stop that can be hard to avoid. Remember, you only get 4 credits, and even if you’ve given yourself the maximum number of lives per credit (8), beating the game can be challenging – make sure you have as many lives as possible before you get to Level 6. The challenge is good though, as it requires you to hone your ‘combo’ skills in the game. Playing this game alone or in the excellent 2 player co-op is tremendous fun.